Congressional midterms after a President wins the White House can be a brutal affair. The out-party tends to be motivated and has a knack for taking it out on Congress. The incumbent party, usually, is unable to match the opposition’s energy and so losses tend to follow. But it’s not all bad. Sometimes there are losses, but minimal ones. In 1926, 1962, 1986 and 1990 the losses were kept to less than 10 seats. 1954, 1970, 1978 and 2014 the losses were less than 20 seats. On the Senate side, the situation is slightly less depressing, owing to the fact that only one-third of the Senate stands for election every two years. Still, the White House incumbent party tends to lose Senate seats about 71 percent of the time, with losses averaging about 6 seats. Here, there are more exceptions where seats were either gained or none lost: 1906, 1914, 1934, 1962, 1970, 1982, 1998 and 2002. Now, a note. 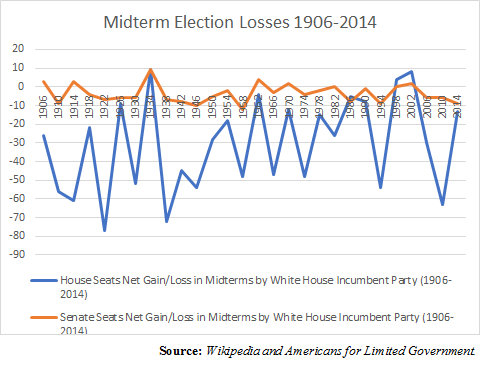 Midterm losses are not fatal. In recent history, both Bill Clinton and Barack Obama recovered from their crushing losses in their first midterms to win reelection. That aside, there is some correlation between those years when the House losses either did not occur or were less bad, and years when Senate seats were actually picked up or not so bad. Meaning, success in either chamber of Congress electorally tends to predict success in both. In modern history, the presidents that managed to beat the averages on the Senate side, where no losses were felt in a midterm include Franklin Roosevelt, John Kennedy, Richard Nixon, Ronald Reagan, Bill Clinton and George W. Bush. Caveats include Clinton, who lost Senate seats in his first midterm, and merely broke even in 1998. Looking to those examples, Roosevelt was still rising politically on account of the Great Depression, where Republicans were nearly brought to extinction in 1934. Kennedy had the Cuban Missile Crisis in 1962. Nixon had the radical antiwar movement in 1970 (and 1972 for that matter) that turned out to be politically counterproductive for Democrats. Reagan arguably had a favorable Senate map, with safe Republican seats, despite the high unemployment and bad recession in 1982. Clinton in 1998, although he was facing his series of scandals, had an economic boom, a soaring stock market, low unemployment and a balanced budget, with Republicans running on impeachment in contrast. Bush in 2002 had 9/11 and votes on the Iraq war. What was consistent in these examples was depressed opposition party turnout and often boosted incumbent party turnout. So, if you’re President Donald Trump and his political team, considering these examples and just how you win any election, the goal has to be to depress Democrat turnout and maximize Republican turnout. But how? Right now, after key losses in Alabama and Virginia, it is clear it is Republican turnout that was depressed. The question then is how to flip the script. Using the historical examples outlined above, there are some key correlations. Like Nixon in 1970, Trump has engendered radical, sometimes violent, opposition on the left in groups like Antifa, particularly on issues like illegal immigration. Like Reagan in 1982, Trump has a favorable Senate map. Seven of the eight Senate seats up Republicans are defending were won by Trump in 2016. And ten Democrat seats up for election were in states that Trump carried: Florida, Indiana, Missouri, Montana, North Dakota, West Virginia, Wisconsin, Michigan, Pennsylvania and Ohio. This part is key to minimizing losses on the House side, is by getting momentum on the Senate side in the elections. 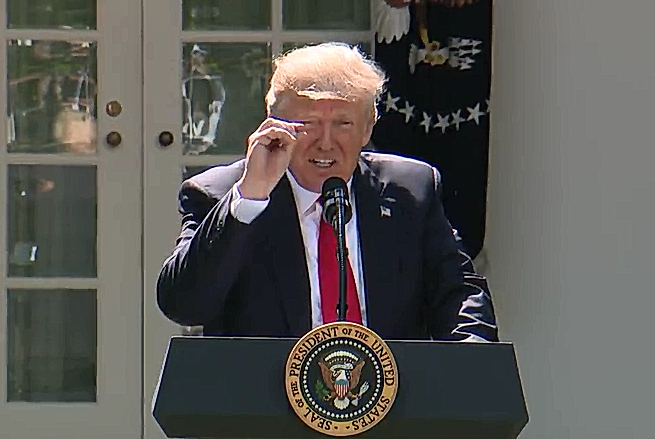 Like Clinton in 1998, the stock market has been on the plus side, unemployment low and the opposition Democrats have been running on impeachment while chasing down the Russia collusion conspiracy like unhinged whackos. In the meantime, Republicans have successfully sown a counter-narrative that it was Democrats and the Obama administration that was illegally spying on the Trump campaign in 2016, launching a national security investigation to suit a Hillary Clinton campaign talking point. With the House Intelligence Committee memo’s release imminent, this unparalleled level of misconduct at the highest levels of the Justice Department, the White House and the intelligence agencies while former President Barack Obama was in office, could be a game-changer. Republicans will want to take advantage, therefore, of what emerges from the memo. Force Democrats to vote on reforms to the Foreign Intelligence Surveillance Act and the Patriot Act that will stop these kinds of political abuses from happening again, compelling them to accept the premise that Trump was in fact inappropriately spied on using DNC and Clinton campaign-funded opposition research by Fusion GPS and ex-British spy Christopher Steele. In other issues, one thing Democrats can ill afford to give President Trump is funding for his southern border wall, even if they only believe the wall is symbolic. It would be another policy win for Trump. On the other hand, granting Deferred Action on Childhood Arrivals (DACA) amnesty to those who were brought here illegally as children — and to their parents — and then not stopping chain migration and the visa lottery for several years while the current waiting lists are exhausted, as is now proposed, could be something that dispirits Republican turnout in 2018. With that in mind, Democrats appear utterly unwilling to deal with Trump on any of his proposals, fearing to give Trump anything he can say he won on — even if they get a lot of what they say they want. Which is why Trump should be careful not to offer too much. The safer bet is to settle on the legislation offered by U.S. Rep. Bob Goodlatte (R-Va.) that ends chain migration, eliminates the visa lottery, fully funds the southern border wall and implements national E-Verify. The President outlined many of those priorities in his first State of the Union Address, and now he needs to fight to see them realized. Then there are the battles over funding the government. Democrats appear unwilling to live through a government shutdown with Trump, meaning their position is weak. Senate Republicans might consider putting the Goodlatte bill or the important parts of the Goodlatte bill, onto the omnibus spending bill that already passed the House as an amendment, and then putting it up for a vote. Democrats will filibuster, and the government will partially shut down again. And then just hold the red state Democrats up in 2018, including West Virginia Senator Joe Manchin and North Dakota Senator Heidi Heitkamp’s feet to the fire. But also put pressure on Florida Senator Bill Nelson, Missouri Senator Claire McCaskill and Pennsylvania Senator Bob Casey. They’re voting to shut down the government in Trump country. The point is the odds are Republicans lose seats in 2018, meaning the risk could be in not taking a few risks. With the House, Senate and White House, Republicans are in a better position to win a government shutdown battle than they ever will be. They should consider that they can get some of the President’s key priorities, including the wall and infrastructure, included with the omnibus, debt ceiling and continuing resolution votes. In between, there are the standard wedge issue votes that can be had. Defund Planned Parenthood. Require federally funded universities, including private universities, to comply with the First Amendment requirement of viewpoint neutrality in the distribution of activity fees as a condition for receiving funds. Require federally funded public schools to do the Pledge of Allegiance every school day. End compulsory union dues for union members for the federal workforce. That sort of thing. In other words, Trump and Republicans with majorities get to set the agenda in 2018. To beat the odds in November, they need to change the script to those items that unify and motivate their base, pull in Trump Democrats who helped him win the Rust Belt in 2016, enrage the radical hard left, and dispirit mainstream Democrats sufficiently. That means racking up victories for Trump and forcing Democrats into votes where they give up too much in return for very little, all the while hailing the wins as bipartisan achievements. In short, show Trump winning on issues that his base wants while Democrats capitulate, and then 2018 can be a lot different than what the prognosticators are currently predicting. President Trump defied the odds in 2016, and while the road ahead is challenging, he can do it again in 2018.